A place to learn, connect and do business, right where you need it. UQ Brisbane City is Brisbane’s premier executive conference, events and training space, situated in the heart of the CBD. Located across three extensively refurbished floors at the heritage-listed 293 Queen Street building, UQ Brisbane City features a range of smart, functional and flexible corporate spaces available for students, alumni and industry to convene, collaborate and create change. Blurring the boundary between a university campus and a contemporary workplace, this dynamic and vibrant business hub is the perfect place to invite the business world in and to connect with colleagues. Our spaces are designed with your business needs in mind, and include an executive boardroom, an exclusive executive lounge, high-tech meeting rooms, small private rooms and an open-air terrace. Featuring state-of-the-art learning spaces and flexible meeting rooms, UQ Brisbane City is designed to give students and professionals the edge for staying ahead. UQ Brisbane City is designed to make collaboration easy. Whether it’s a casual coffee chat, a full board meeting or a high-profile business launch, we've got you covered. Resources on hand include staffed reception, Wi-Fi, printing, phone and laptop recharging, Zoom conferencing, wireless-presenting enabled meeting rooms and catering. Our venue boasts a variety of spaces ranging from 6 and 8-person meeting rooms, an 18-person boardroom, to our 130-seat or 200-person standing ground floor auditorium space. The venue is suitable for training and workshops, seminars, boardroom meetings and AGMs, presentations and networking events. A new CBD home for your professional development. Executive education and postgraduate study – more accessible, more flexible. Students and professionals from UQ Business School’s MBA program and Executive Education courses are taught in smart, functional and flexible learning facilities, with break-out spaces where students, staff and business guests can continue the conversation. UQ Executive Education offers everything from short courses and training for individuals and organisations to tailored programs and consultancy across the private sector, government and industry. Challenging the boundaries of traditional executive education, our interactive learning model uses a combination of cutting-edge research, case studies, presentations, teamwork, simulations, guest speakers and experiential learning to give you a fresh perspective on contemporary management and leadership issues. A lounge you won't just lounge in. The Executive Lounge – meeting your every business need. The Executive Lounge and companion rooms on Level 7 afford The Dean’s Society members and other invited guests a sophisticated, comfortable and convenient venue to work, meet, do business and create change. With its open-air terrace and leafy indoor gardens, the Executive Lounge resonates with UQ’s St Lucia heritage while projecting a contemporary corporate context. Members can order barista-made coffee, delicious pastries and other catering from the street level café, The Daily Coffee Co., or enjoy continuous complimentary tea, coffee, fruit and biscuits. 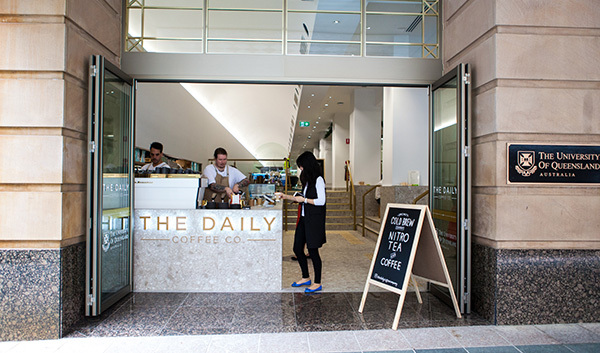 The Daily Coffee Co., run by the award-winning team from premier Brisbane riverside function venue Customs House, welcomes students, staff, members, their guests and other city professionals at the street entrance. Exquisite pastries and wholesome quick lunches are the mainstays of a menu that changes seasonally, transforming the freshest ingredients into enticing options that reflect current trends. Everyone who buys a coffee at The Daily Coffee Co. creates change, with 20 cents from every coffee purchase going to a giving destination, such as student projects, scholarships and start-ups, and community organisations that involve UQ students, alumni or researchers. The Daily Coffee Co.’s social media pages promote special events, including coffee cupping experiences. UQ Brisbane City, UQ Business School Executive Education and the Executive Lounge are accessible to wheelchair users and people who are blind or have low vision. Please note: there are no bicycle or storage facilities available at UQ Brisbane City. For bike parking locations in Brisbane city, visit the Brisbane City Council website. Contact us today to experience UQ Brisbane City.